What is a CT Cardiac Calcium Test? 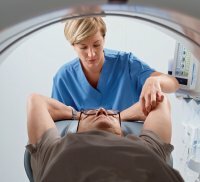 A cardiac calcium CT scan is a simple, safe and noninvasive test used to obtain information about the location and extent of calcified plaque in the coronary arteries the vessels that supply oxygen-containing blood to the heart. CT cardiac calcium scoring is one of the most advanced methods to detect heart disease in its earliest stages. It is available at both our downtown and Clive locations with a doctor’s referral. Check out our brochure to evaluate your risk factors and see if a cardiac calcium score is right for you. Our technician will take a medical history. You will then be asked to remove your clothing and jewelry and change into a gown. You will be positioned face up on the exam table. Electrodes will be attached to your chest and to an electrocardiograph machine that records the electrical activity of your heart. You will be asked to remain still and be given specific breathing instructions. The test is easy, quick, and painless, requiring only 10 minutes. A radiologist will review the images, and we will send you a report that can be shared with your physician. For best results, avoid caffeine and smoking for four hours prior to the exam. You may return to normal activities following your exam. Do You Have Questions Regarding Your Test? * The safety of our patients and those who accompany them to our office is of the utmost importance to the physicians and staff at Iowa Radiology. Please make arrangements for someone to care for your child/children during your exam. Thank you for your cooperation.